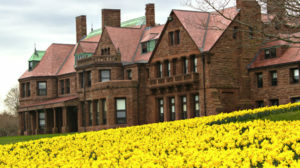 A million daffodils are blooming all over the city of Newport, making a big enough impression to have a festival for an entire week. Dog lovers, artists, kids, and adults will have something to participate in the Newport Daffodil Days Festival. Starting on April 16th through April 24th, there will be “daffy” events including bike tours, garden parties, art activities, doggy parade, gorgeous home tours, and more. Even though most of the activities are free, you can purchase a daffy pin to have discounts in the activities and shops throughout Newport. Opening day will have a ribbon ceremony with games, live music, and a daffy conga line at Bannisters and Bowens Wharves. Meanwhile families can “doodle the daffodils” on a take-home canvas for free at the famous Cliff Walk. If drawling is not your expertise, there will be a photography workshop at the Cliff Walk within the following day. It will have a significant location at the O’Hare Patio, Salve Regina University. The Newport Photographers’ Guild experts will guide the audience how to take the perfect “Daffodillion” photo, so you can enter the online contest. Within the same day, dog owners can dress their dogs in the daffiest attire for the Daffy Doggies Parade. It will run through Bannister’s Warf to Queen Anne Square, so they can match the daffodils along the sidewalk. The best daffodil outfits will be awarded when entering the competition. This is one parade that will be a must see. On April 18th, everyone will have another chance to draw the Daffodils at the Miantonomi Park while the Hot Diggity Daffy Dog Barbeque takes place. The Pell School is also contributing the daffy art by the Chalk-A-Lot Of Daffys event on April 19th. This event is welcoming to create sidewalk canvases of the schools’ daffodil gardens. If you didn’t hear enough music at the earlier events, the famous Christopher Carbone will be sharing musical stories on April 20th. It will be among the daffodils at the Redwood Library, where families can participate in fun games, and win prizes. On April 21st, Newport Tree Society is having an annual Spring Fling at the Chanler on the Cliff Walk. You can bring your daffy derbies, and wear your most attractive hats for a prize. There will a big toast among the thousands of daffodils. This is the time to dress up and listen to the amazing live music that will be playing. Even the Newport’s Mayor is going to join the festival by a tree planting on April 22nd. He will be honoring Earth Day and celebrating Newport 15 annual year of being a Tree City. Afterwards, you can bring children to a tree climbing demo with Carlie Ridolph. It is also a perfect time to go on a tree walk to see more of the daffodils at the Miantonomi Park. On April 23rd, there will finally be private garden tours of the daffodils at the hillside with more than 150,000 bulbs planted on the corner of Catherine and Gibbs Avenue. Of course the Newport Vineyards is having a toast for almost 500,000 daffodils in bloom. You can join their wine tasting and food sampling. During the day, bike tours will begin at the Touro and go all through Newport. You must not forget to stop at Ballard Park for “Bouquet Bar”, where you can purchase spring flowers. Families can also enjoy nature with a tree walk to see Woodsy the Owl. The last day, April 24th will end with private house tours of the beautiful homes. Their gardens filled with beautiful daffodils. On top of the tours there will be antique cars at some of the houses. Some of the classical cars will be driven along the Long Warf, Ocean Drive, and Bellevue Avenue. The festival will have a final garden party with live music and ballet at the Bellevue House with a cash bar. There is a little something to do for everyone in this daffy festival. You would not want to miss it.